Okay, I know that I promised something regarding Bridget Zinn and Poison for this week. I lied. 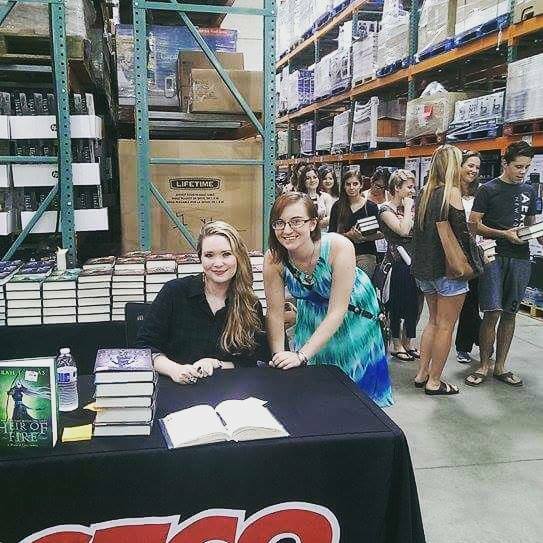 BECAUSE I MET SARAH J. MAAS LAST SATURDAY, GUYS. I’m from a really small town in New York, where no authors ever come near. 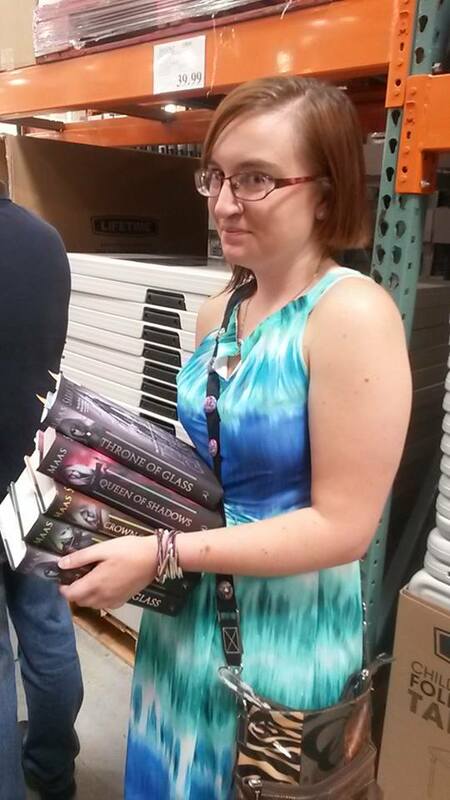 Remember that time I traveled five hours one way to see Cassie Clare, Holly Black and Sarah Rees Brennan? No regrets, but yikes. Anyways. 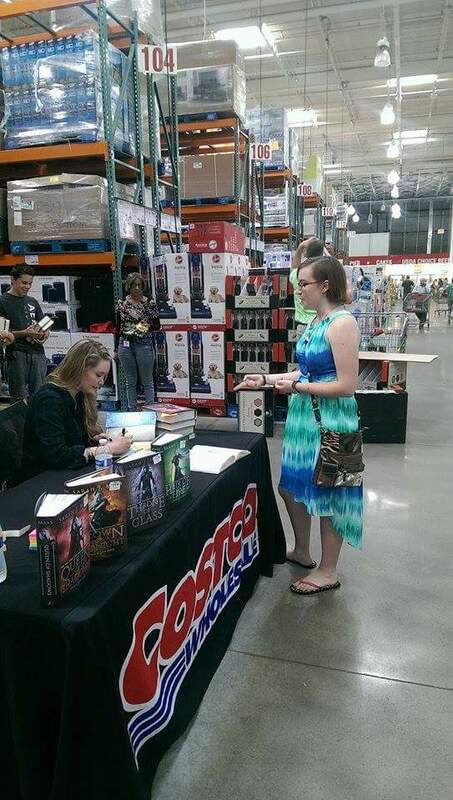 Sarah JUST HAPPENED to add a few extra stops in Pennsylvania to her Queen of Shadows tour, and ONE OF THEM WAS ONLY 4 HOURS AWAY. I couldn’t miss this chance. Ahem. So what makes this a Thesis Thursday post, you ask? Because I wasn’t kidding when I said last week that the basis of my thesis is Sarah’s books. Literally. My entire evolving idea has had Throne of Glass as it’s center cog. When I did my Worth It Wednesday post for this series, I also talked about last year and my academic conference presentation that centered on her books. Now that I’m a senior, I get to do my English work on books *I* pick. And right now, that’s just … SarahSarahSarahSarah. Her books also exemplify the way that I would like to be as a writer, which is what I’m incorporating into the novel I’m writing for my other senior project. Not just in how much fun the books are, but also in how they’ve grown and changed as the series has been published. Her books aren’t just amazing for a reader; for a writer learning their craft, Sarah sets a great example for debuting strong and consistently getting better. So this is a Thesis Thursday not because I did any actual work (ha!) but because I got to meet my idol and she was amazing and for this week I’m just going to revel in the fact that I am writing an honors thesis and I AM EXCITED ABOUT IT. And Sarah is a big reason why. 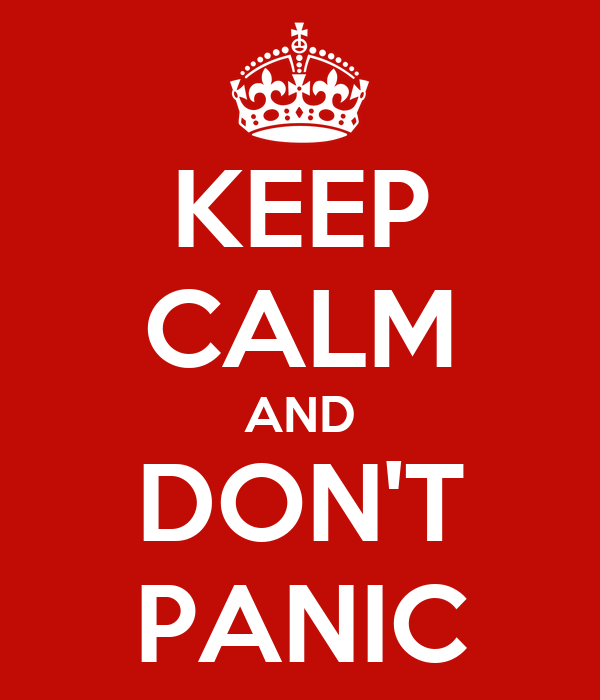 Okay, nobody panic. This feature sounds kind of pretentious and crotchety, but it isn’t. In fact, this feature (which may not always be weekly) will be a combination of book reviews, tirades against academia, writerly panic and frustration, rants about book tropes and fan girl freak-outs–usually about Sarah J. Maas, probably. Let me explain. I’m a senior this year. *INSERT PANIC HERE* I have chosen to inflict upon myself the year long English Honors Thesis course that my Department offers here. Now here you might expect me to say that I’m studying Shakespeare or some post modern writer or something. Well, you might. But you’ve been following me on this blog and you know that that isn’t my style. First things first, remember that post I wrote about being an English and Writing double major? While I’m writing this English Thesis, I’m also completing my Writing Senior Project, which is a novel. This will come into play later. The topic of my English Honors Thesis, broadly, is YA publishing trends and female assassins. 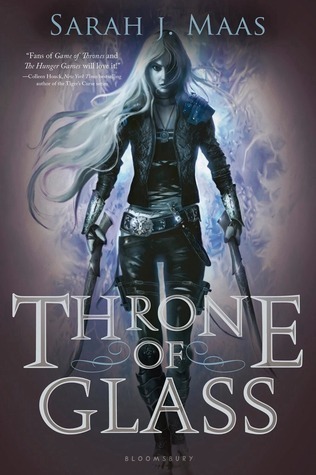 It’s conception came from me saying HOW CAN I JUST KEEP REREADING THRONE OF GLASS FOR CREDIT? Turns out, my thesis adviser really likes what I came up with. I’m not going to bore you with the academic details, I’m just going to say that I’m going to be writing about the tropes of these books and therefore reading a bunch of books like Throne of Glass to make my point. Which is where the rants about annoying tropes and the book reviews come in. I’ve actually got a short list on Goodreads about what books I’m considering. The YA publishing trends component of this is going to mean that there are some books on there that don’t make sense, but don’t fret. I’ll explain that all in due course whenever I figure out what the hell I’m doing. Don’t forget that novel I’m writing! It occurred to me, rather late in the game, that if I was doing all this work talking about tropes of female assassins and what they do well and what they don’t that maybe I should WRITE the book that destroys all the tropes I hate and is actually more like what I want to read. So far I’m two chapters in and while I’m way rusty (more on this later), I’m making myself laugh so that’s about the best I can expect. Still with me? If not, that’s cool. I honestly don’t know if anything remotely interesting will come out of this besides amusing rants and more book reviews, but that’s okay. At least it’ll help me sort out my thoughts. Tune in next week when I discuss Poison by Bridget Zinn, why I can’t tell if I like it or not and why I’m confusing myself as to whether or not to consider it for my thesis! I started out this blog talking about the two different parts of me, and how they work together. I’m going to end it by talking about how they stand apart. Granted, I’m going to be focusing more on my Writing major, just because the Poetics is a Writing Department class, but trust me when I say that the point I’m about to make is applicable to my English major too. What do you make and is it similar in any way to the art practices we’ve read and/or talked about in class? Why do you make it, and do you see your ideas aligning with or being similar to the “why” of anyone we have read and/or talked about in class? What is the relationship of language to what you make, and is this relationship in any way similar to anyone we have read and/or talked about in class? What was the most influential/important reading and/or concept to your own processes of making? You know what I’m absolutely sick of? Realizing there are two ways I want to answer these questions. 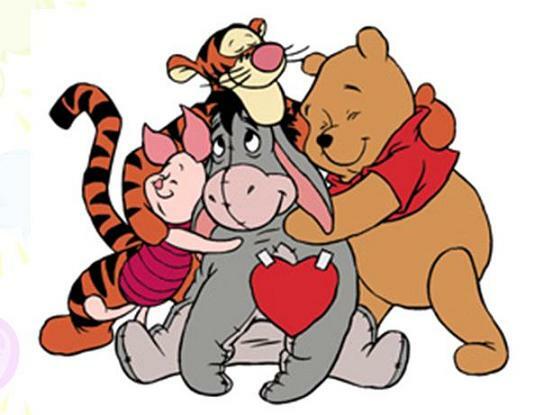 Then realizing that one of them is just another story I’m afraid to tell. Recently, in my Renaissance Literature class, the professor asked us what we were going to be reading over the summer. My answer would have been Sarah J. Maas’s A Court of Thorns and Roses. But I didn’t answer, because people starting saying “Milton” or “Absalom, Absalom.” My answer didn’t seem like it fit. You may or may not know this, but this blog was originally a poetry blog. DO NOT GO BACK INTO THE TAGS AND FIND IT. It was bad and it’s all really old now, like pre-college, beginning of high school aged. But I just wanted to preface this discussion with that. 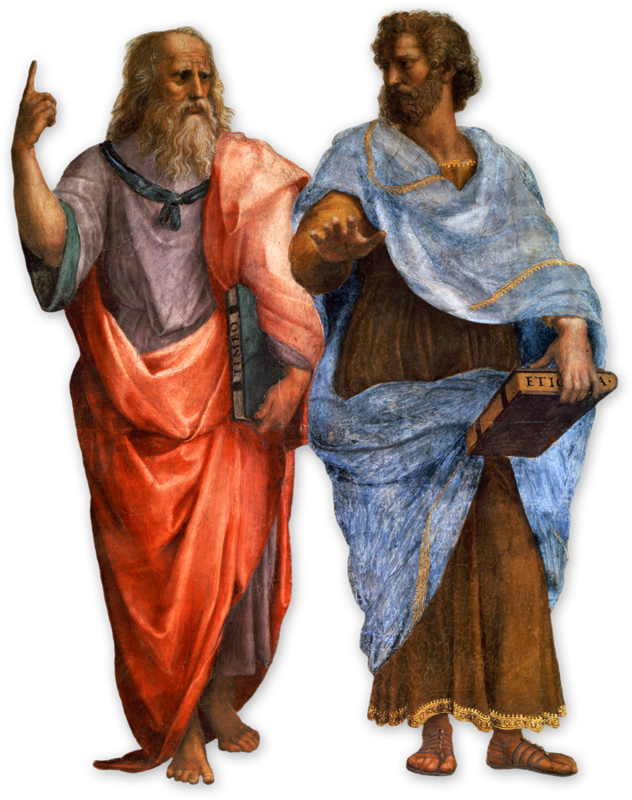 So this week’s readings for my Poetics class was Plato’s Republic, Book X and Aristotle’s Poetics. If you haven’t read them, don’t worry. Basically the point of them–especially Plato–is to crap on the life and the work of the poet. What’s important–and frustrating–is the effect that this kind of philosophy has had on poets since Plato decided to open his mouth. You can Google lists of pieces titled, in essence, “In Defense of Poetry” or “Apologies for Poetry.” It’s ridiculous, especially considering poetry’s past power. Confused about what I mean? Well, what do you think of poetry right now? If one person says they’re a novelist and one person says they’re a poet, who do you rank on top? Poets have been characterized as goths at coffee houses (perfectly valid life choice for poets, but not the only one) or cryptics saying nothing in the media, and that certainly adds to the effect. I know I’m not a poet. I’ve written more recent poetry for school and I’m basically the kind of poseur that Plato would like to kick out of his Republic. I’m aware of that. That’s why I’m not a poet. 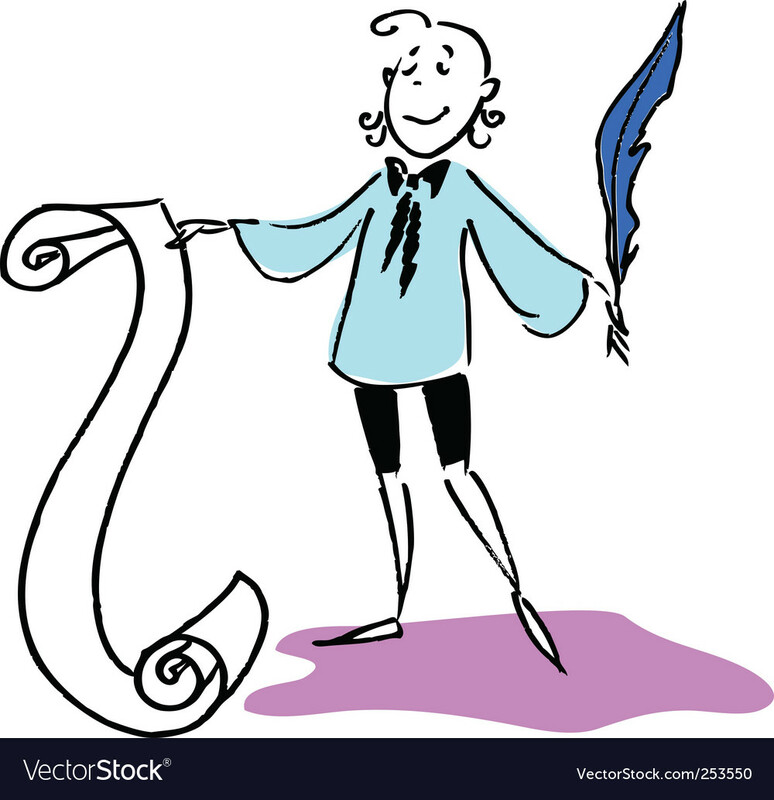 But, thanks to school, I have studied multiple forms inside and out in accordance with both my English and Writing degrees and I RESPECT POETS SO MUCH. I can barely rhyme let alone formulate a sestina (look it up – the form will make your head hurt). I write short stories and novels. This is a kind of writing I understand the conventions of. 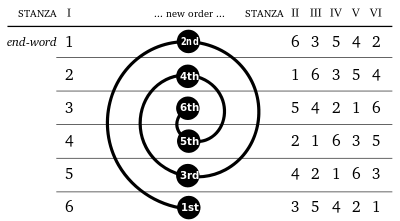 You can master a basic plot pretty quickly. Poetry? Dear Lord. 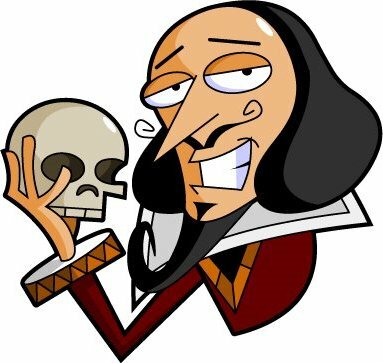 I’ve studied Shakespearan sonnets since grade school and when I was required to write one for class I STILL ripped the end-rhymes from a sonnet Shakespeare had already written because I couldn’t get the rhyming down. My point is: I never thought I’d be disappointed in someone like Plato, who I’ve been told to laud as a philosopher since PBSKids morning TV shows. I understand that there is a certain time period that he’s writing from and all that, so maybe it’s more correct to say that no one has thought to update their opinion much since then. Poets remain a feature of the classroom: an annoying period of English class or a specialized class in college. They aren’t all that mainstream and they certainly don’t get the buzz of NYT bestselling novelists. The one thing they do have going for them is their community. When I blogged poetry, as bad as it was, I was welcomed without a second thought into the poetry blogging community with open arms. I have yet to have an online experience since then that has felt as natural and warm as that. In the real world there are also magazines, retreats, etc, that might not (always) be big, but they are proud. Hey, Gretchen here, and I have a confession. Due to the unconventional nature of my high school experience, I have no freaking idea what is actually on a general required reading list for anyone. 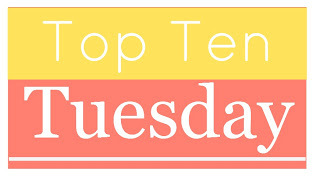 So I decided to do the secondary topic this week, Top Ten Books That I Wish Were Taught in Schools. Again, I have absolutely no idea what SHOULD be on this list, so I came up with a bunch of my own for my own reasons. Cool? Cool. Here they are, in no particular order.